annie's littlefootprints: Robin Williams is right! Ok, I know that this word art is seen everywhere right now, but it is with good reason! I think a lot of people get tired of winter and are more than ready for spring when it arrives. 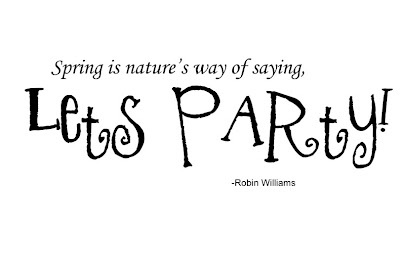 So...why not celebrate spring as one great big nature party?!? Besides, I made this word art a long time ago, so I might as well share it when I'm in the mood for a party! Thanks so much for sharing this great wordart! Thank you for the lovely word art the love series is a real keeper.